NU PRSSA attended BU PRSSA’s Regional Conference PR Advanced: Unleash Our Generation on Saturday. Through breakout sessions, keynote speakers, an interactive panel and career fair, our members were able to gain valuable insight into the field of public relations. Brittany Troy, a Northeastern graduate, captured the day in a blog post for IDEA, Northeastern’s Venture Accelerator. To learn more about the conference, check out her article here. On Thursday, February 23rd, NU PRSSA is co-sponsoring a discussion group/presentation with the Student Government Association. Our purpose is to provide student organizations with help in promoting their own events on campus. Come out to 300 Richards to hear some great tips from SGA and NU PRSSA! Adam Ritchie, owner of Adam Ritchie Brand Direction, works in public relations by day, and rocks with his band, The Lights Out, by night. 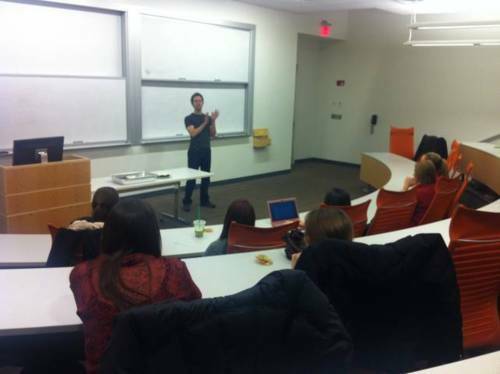 During our Wednesday night meeting, Adam came to speak with us about his road from PRSSA member at Syracuse University, to opening his own public relations firm in the heart of Boston. He explained the importance of networking in our public relations job searches, and how employers frequently ask fellow coworkers for candidate recommendations first, before turning to career sites. Adam explained the advantages of informational interviewing, and how to approach your “wishlist” of companies to line them up, even when there are not any open positions. For more information on Adam or his company, visit his website at http://www.aritchbrand.com, or message him on Twitter at @aritchbrand.